Pictured from left to right are Hon. Rosa Cantu, Cartwright School District; Hon. Lydia Hernandez, Cartwright School District; Hon. Jose Arenas, Pendergast Elementary School District; Hon. Francisca Montoya, Fowler Elementary School District; and Hon. Corina Madruga, Tolleson Union High School District. The National Association of Latino Elected and Appointed Officials (NALEO) hosted an Education Leadership Initiative Policy Institute in Washington, DC on March 24-25. 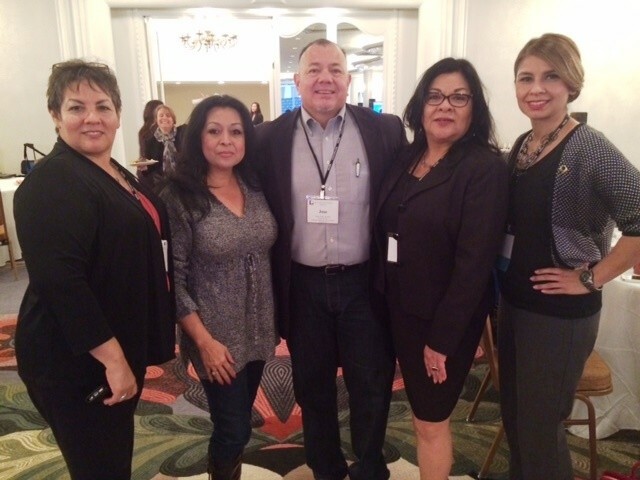 Seventy-two Latino school board members representing 14 states took part of the institute and received professional development opportunity to strengthen leadership and capacity to effectively serve Latino constituents in the respective school board districts and jurisdictions. The two-day institute was sponsored by the Bill and Melinda Gates Foundation and State Farm. National education experts presented a curriculum covering topics on Effective Leadership, Parliamentary Procedures, and Federal Education Policy Update. Additionally, the institute offered an overview of lessons learned and the path forward with Common Core State Standards and assessment implementation with templates for developing district plans with guidance for curriculum alignment.